Aerobic Exercise: what is it? Aerobic exercise is any activity involving large muscles, makes your heart and lungs work harder and is done for an extended time. 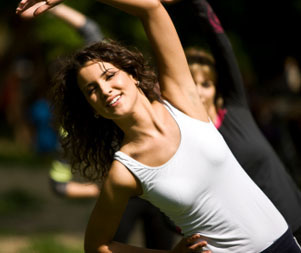 Some basic examples of aerobic exercise are walking, biking and jogging. However even raking the leaves, walking the stairs at work and gardening can be considered aerobic exercise. So many benefits to aerobic exercise! The benefits of aerobic exercise can't be ignored. They add years to your life and quality to your years. Aerobic exercise involves continuous and rhythmic physical motion so it improves your stamina by helping your body become more efficient and use less energy for the same amount of work. The more aerobic exercise you do the more conditioned your body becomes, the more efficiently your body runs and the smoother your body functions.